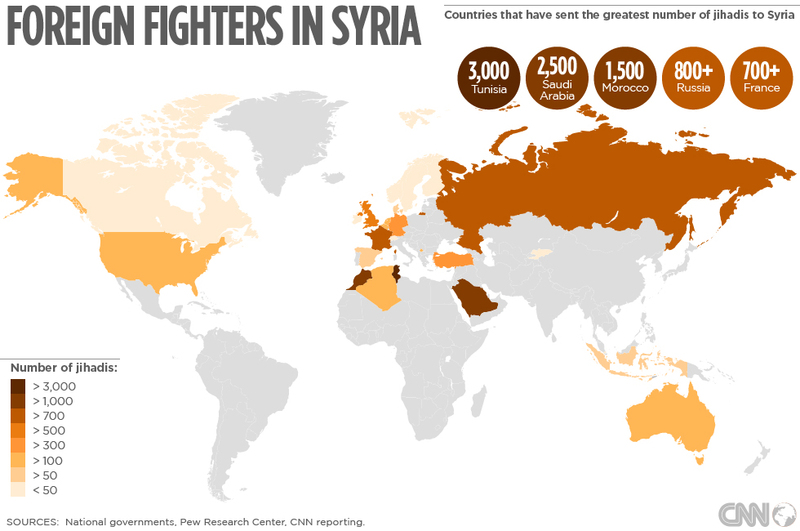 Syria's foreign jihadis: Where do they come from? At least two Americans have been killed in Syria, and the video of James Foley's beheading is narrated by a man who seems to have a London accent, raising fears about the number of American and British Muslims going to fight in Syria. But do the U.S. and UK have the greatest problems? 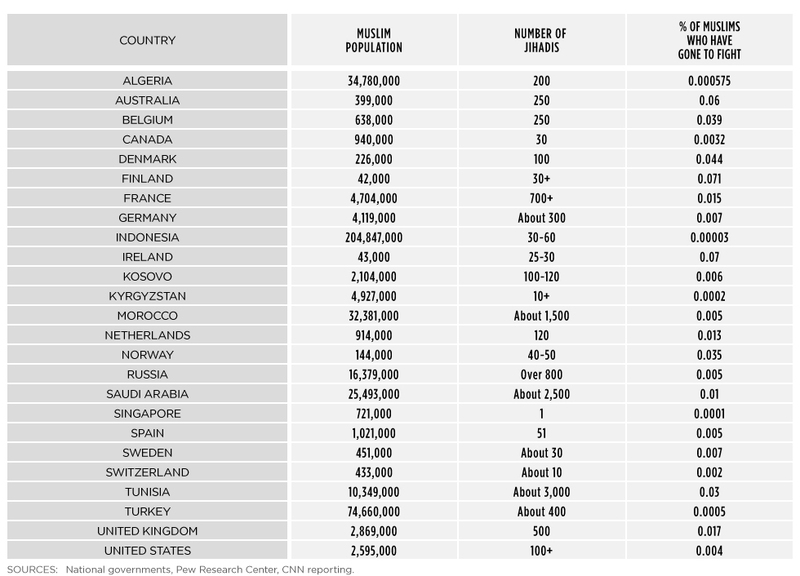 CNN crunched the numbers from 25 countries that have given official estimates of how many have gone to fight. More than 11,000 people have traveled from abroad to fight in Syria, officials suggest, although some have gone back home again. They ally themselves with different factions, and sometimes change loyalties as groups merge, disband or change allegiances. 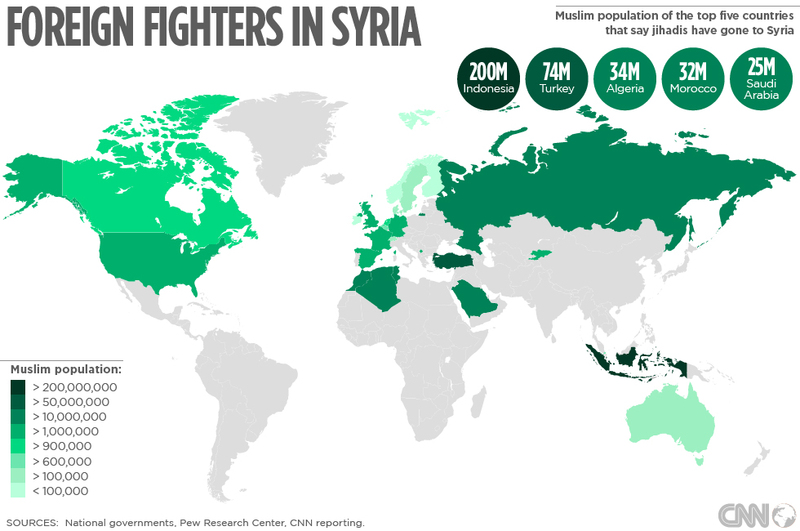 Naturally, countries with bigger Muslim populations tend to send the largest number of fighters. Viewing this on mobile? Click here to see a larger version of this map. But some countries with relatively small Muslim populations have sent a disproportionately large number of jihadis. 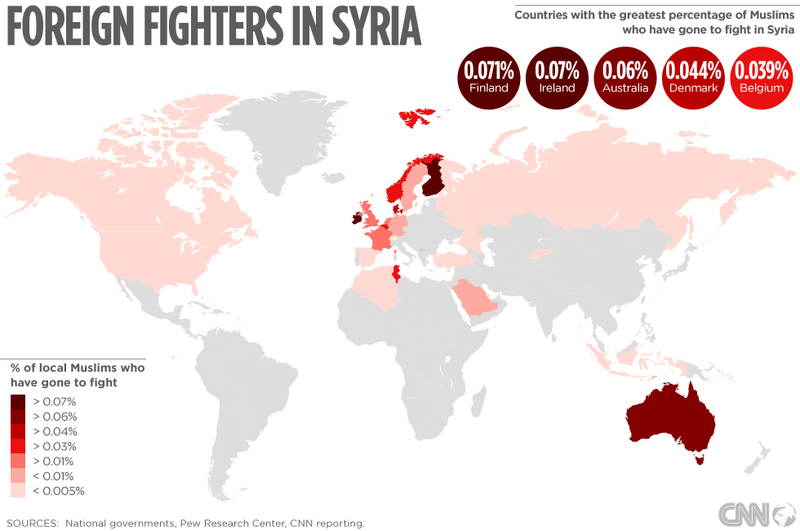 Finland and Ireland have the highest number of foreign fighters per capita -- nearly one per 1,400 Muslims living in those countries has gone to Syria. Viewing this on mobile? Click here to see a larger version of this map. Indonesia has the world's largest Muslim population, but tiny numbers of fighters going to Syria. And even countries closer to the conflict such as Turkey, Algeria and Morocco have sent relatively few. (Pakistan, India and Bangladesh, which all have more Muslims than any country other than Indonesia, have not issued official estimates of how many of their citizens, if any, have gone to Syria.) Viewing this on mobile? Click here to see a larger version of this map. Britain and France have comparable percentages of local Muslims going to fight in Syria -- just over one in 6,000 British Muslims and one in 6,666 French Muslims have gone to Syria, governments say. The figures in the Netherlands are not far off, around one in 7,700. American Muslims are going to Syria at a much lower rate, closer to one in 25,000. Viewing this on mobile? Click here to see a larger version of this table.